If you’ve been reading my articles here, you already know that I love my word games. Unlike other game genres, Word Games let me play when I want to. They don’t need my constant attention and they’re easy to keep aside and continue from where I left off. My favorite word game to be released on the App Store, ever, has been Letterpress. 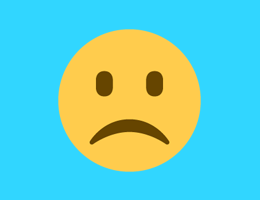 Loren Brichter came back to the App Store with a huge bang with that one and Letterpress continues to be immensely popular with the masses. I’ve also been playing Ordet a lot lately, which we wrote about a few days ago. But I also recently stumbled across Clever Clues after one of you fine readers emailed us about it and it has had me hooked ever since. 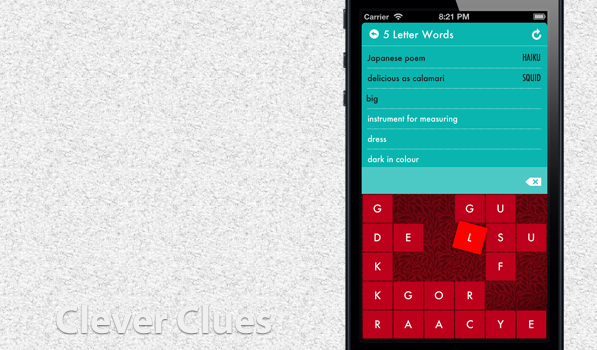 Clever Clues has been brought to the App Store by Australian developer Andrew Tetlaw. It is a very addictive word quiz that will make you shake and shuffle your vocabulary. Andrew puts Clever Clues as “the saucy love child of a crossword and a word search”. In the game, you are presented with a set of clues along with a grid of letters. You have to guess what the clue is and then check the word form the grid of letters. So in the screenshot above, “dark in color” could be dusky. So you’d type in D-U-S-K-Y and if correct, Clever Clues will automatically accept it. You can begin with 3-letter words clues go up as you finish each level. There’s really not much to explain about Clever Clues. It sports a nice, flat UI design and is meant to be a lot of fun when you’re playing it. It’s available FREE on the App Store, with IAPs for additional clues. The free version gets you four games of 3, 4, 5 and 6 letter words with 60 clues in each game. There are 99 cent In-App Purchases for topic based games of 7 or 8 letter games as well. The free version itself is a good start.